A generation ago, when people argued against the existence of God they would argue mostly asking for objective evidence for His existence. These days, in the postmoden era, it seems like the main arguments against God have more to do with painting God as a moral monster, or the like. 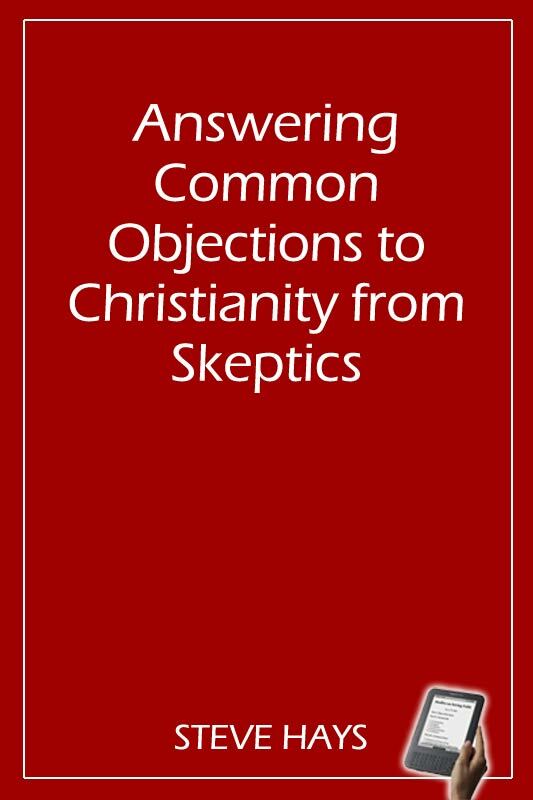 The following are questions we frequently hear asked with an answer by apologist Steve Hays for each one. Hope you find this useful. 1. Why Does the Bible Condone Genocide? 2. Does the Old Testament Endorse Slavery? 3. If God truly loves people why has he slaughtered so many of them throughout the history of the world? 4. No One Religion can Know the Fullness of Spiritual Truth, Therefore all Religions are Valid. It is Arrogant to Say Otherwise. 6. God is just a man made fairy tale. There is NO god period. There never was, and there never will be. If you take some time to do some critical thinking you will reach the same conclusion. 7. If God really cares about people and is all-powerful, why doesn't he create food for all the starving people in the world? Why doesn't he stop the earthquakes and tsunamis? 8. If God really cares for all people equally, how can he have a special "chosen" people? 9. If God created everything, why did he create AIDS, the ebola virus, etc.? 10. How can it be just to consign people to eternal torment in hell for sins committed in a relatively brief time on earth? 11. How can it be just to send people to hell when they have never had the opportunity to believe in Jesus? 12. If God truly wants people to believe in him, why does he not simply show himself to them like he did to Paul? 13. If the Christian faith is false or based on fabricated source documents, how would you be able to detect the error given your belief that the bible is the only admissible, authoritative evidence? 14. Why do Christians refuse to accept the scientific evidence for an old earth, evolution, etc., when they have no problem enjoying thousands of modern conveniences which are the result of this same science? 15. Why do Christians refuse to accept the historical and archaeological evidence that much of the bible was plagiarized from ancient near eastern sources? 16. If the bible has all the answers, why are there literally hundreds of Christian denominations that all think they alone are right and all the other Christians are wrong? 17. Why are Christians always the first to support the rights of greedy corporations, unrestricted gun ownership, invasion of foreign countries, the death penalty, etc., but the first to oppose helping the needy through welfare, foodstamps, and so on? Doesn't the bible teach mercy, the "Golden Rule," peace and non-violence? 18 .If God loves men and women both equally, why does the largest Christian Church (and many other denominations) refuse to allow any women, however gifted, to have any place of authority in the church? 19. If God loves all people, why does he condemn gays just because they were born with a different sexual orientation than heterosexuals? 20 . If Jesus died on the cross for the sins of the whole world, then how can God send people to hell to pay for their sins again? Was Jesus' payment not good enough for him? 21. How can you trust God's plan to bring you to a perfect heaven when he has a track record of failures? He created angels in a perfect place, but they rejected him and are now doomed to suffer forever; he put Adam and Eve in a perfect place and they lost it; he had to destroy the whole world in Noah's day; he had to confuse the languages at the Tower of Babel; he started the Church, and it ended up with Crusades, bigotry, division, etc. If he has failed to accomplish his plan of giving people a perfect place to live so many times, what makes you think he will actually get it right this time? 22. If Christians are really supposed to love others, how can they be happy for all eternity knowing that the majority of humans, and even some of their own friends and family, are in conscious, endless torment? 22. If Christianity is the only true religion, how come so many other religions are just as successful at making people good, ethical, and moral, and making them feel fulfilled and happy?